Home / News / PUMA launches their latest Frenzy Pack for the season ending! Unleash the Frenzy | PUMA launches their latest Frenzy Pack for the season ending! Everything is on the line now! The season ending is drawing closer, and every point and match counts. Feel the chants and noise from the fans and turn it into energy and power. Unleash the frenzy with PUMA’s new Frenzy Pack! As the season ending draws closer every match and point counts. Every match is going to be played as a final, securing vital league placements and trophies. These games are made for the very best players, and only they will cope with the pressure and perform to give the needed results. But what are important games without the fans. Their passion will be on the highest. They will make more noise, turning on their flares, waving the flags and chanting their hearts out. All their colours, energy and adrenalin will clash and be reflected onto the pitch. The players will take the energy and turn it into frenzy of colour and magic. No one can ignore the intensity of the games, and a few can turn this into energy and power. The new PUMA Frenzy Pack includes colours for both the Future and the ONE, so all PUMA pro players can look forward to play in new and energetic colours. Both boots are made with fresh colours that both symbolizes the frenzy and energy, which often is seen in the season ending. But it also symbolizes colours seen in the months during the spring, when the warmer days arrive, and it gets greener outside. The PUMA ONE leather boot is kept simple and classy. You could say that it’s ready for spring and the warmer months, with it’s green based colour and blue details on the sock. 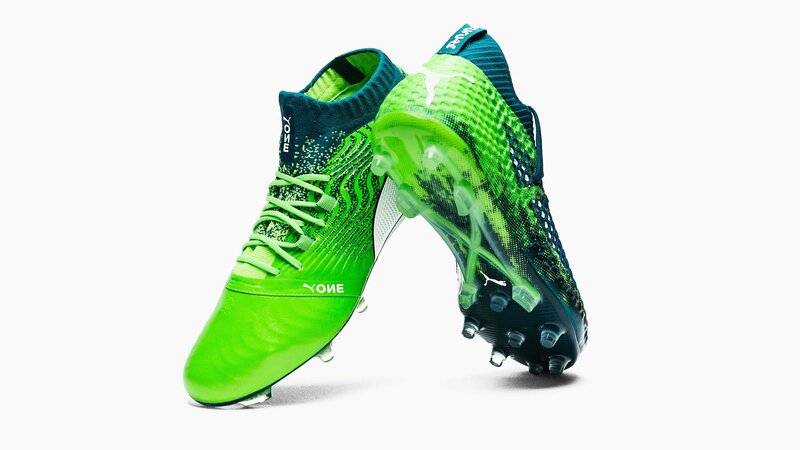 We are more than certain that the PUMA ONE is going to shine on the pitches when Sergio Agüero has laced these boots and ready to score the game winning goals and securing the title and trophies. PUMA ONE still offers a lightweight feeling and a comfortable touch thanks to the leather. The evoKNIT sock offers the same good support and stability, while the super thin, soft and supple kanagaroo-leather gives you the ultimate touch and tight feel for the ball. Mix all these things together, and you give your attackers the best conditions to score with Frenzy. Are you ready to unleash your frenzy and securing the vital points? Then find the latest PUMA Frenzy Pack boots right here!